The Official Thomas Bickle Blog: Hearts and HA! This is Thomas's anaesthesiologist for radiation. Thomas loves him. Really. 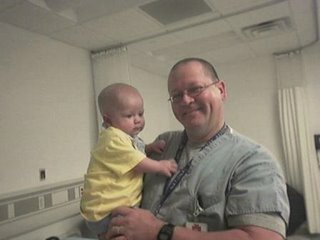 When I would carry him (T, not Dr. M) down the hallway toward the treatment area, Thomas would get all excited (indicated by "train hand" - pumping up and down like "Choo choo"). Then when he saw Dr. M, he'd smile really, really big, usually for the first time of the morning. On the last day, he just reached out to get into Dr. M's arms. This is a big compliment. Thomas has figured out that if he's being handed off, Mama is probably going to run off and do something irresponsible like use the restroom or get lunch. He is a sociable little guy, and I admit, a flirt, but he does not like to be handed off. So, we have really, really great doctors, but Thomas has chosen. Dr. M wins the award. Great choice, too, becuase if I liked him at 6 in the morning, you know he has to be pretty durn nice. Before the phase entirely passes, I should share the joy of The Universal "Hah!". When Thomas got his trach, he didn't make any noises at all. It was really scary to sleep near him at night, knowing we had to wake up at the slightest sound that could be phlegm blocking his breathing. After a few months, he started making little grunting noises, so we started using this cool contraption called a Passy-Muir valve (looks like this). It works like the top of a kazoo - air can come in, but not go out. The breath is forced up through the vocal chords and comes out as sound. And man, is he loud now. Wearing it reminded Thomas how great it is to be noisy, I guess, so he has slowly learned to make noises even when he's not wearing the vavle. His noise, for the last month, was The Universal "HAH!". Who knew you could communicate so much with one syllable? He had a "Hey, look, a baby," HAH, and a "Mom, where'd you go?" HAH and a "Yay, Dada's home!" HAH. I thought I was having over-active Mamagination, but one of the friends we visited out of town noted, "You could make a whole language just using his different uses of HAH." The Universal Hah was fun times, but recent practice with the valve has added "Viiiiiibb," "BOP! ", "Mah", and on special occasions, "Viiiiiibbbopmaaaaahviiiiib." It's been a special-occasions week. He's doing so well. Soon, I will share the photo of him in his hand-me down Halloween costume; I dragged it out of the closet on a chilly morning (it involves a hoodie - cute and handy) and I nearly died of cuteness. I never say stuff like that, so you know it's true. nearly died of cuteness. haha. its great! What a precious - awesome picture! Big guy - little guy! I can only imagine the large amount of people that Thomas has met and dealt with during these last months. I'm sure many hearts have grown larger with love after seeing Thomas - knowing that if this tiny human being can have so much courage - then they can, too. He may be small - but he's truly larger than life!